The wheels are set in motion to crash Big Mom’s latest political marriage! 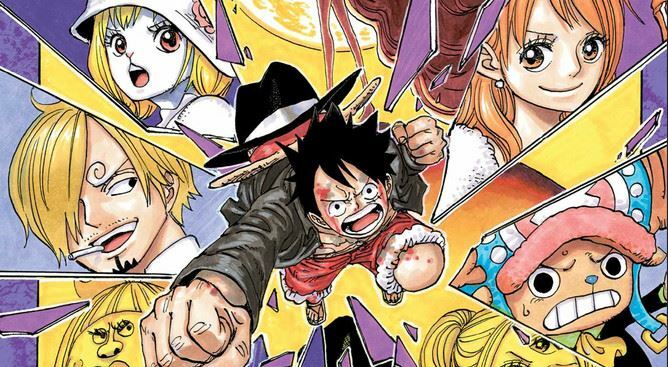 One Piece is my favorite manga of all time, so it’s only fair I make a confession for my first review: I’m not that crazy about the Whole Cake Island arc. 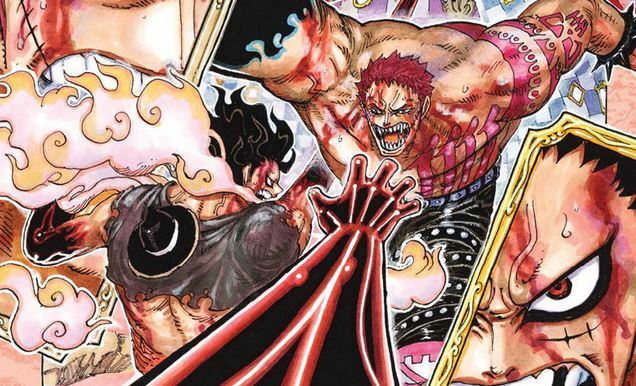 Yes, it’s wonderfully creative and Eiichiro Oda’s art is as delicious as ever (almost literally, considering the emphasis on food), but like Dressrosa before it, it attempts to juggle a ton of elements at once and isn’t always successful. For instance, Sanji’s leaving of the crew makes for a powerful chapter closer, but that it’s essentially repeating Nico Robin’s character arc this late in the game induces a deflated reaction of “we’re really doing this again?” Meanwhile, Big Mom’s dozens upon dozens of children are rather difficult to keep track of (owing to their sharing of the “Charlotte” name), and they overcrowd what’s already a sizable number of forces at play (to recap: Luffy and the Straw Hat pirates, the Vinsmoke Family/Germa 66, Big Mom’s enforcers and Homies, Jimbei’s Sun Pirates and Capone Bege’s Firetank Pirates). 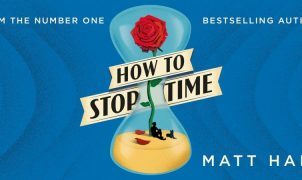 And while this won’t begin until two volumes later, that we’re only just approaching the end of a life-or-death chase that’s been going on since July is more than a little exhausting. Needless to say, it’s an immensely busy whirlwind of events, and that’s why I’ve grown ever-more thankful for the volume releases: in my rush to devour the weekly chapters introduced in Viz’s Shonen Jump platform, a number of details become easily forgotten, and so these books are quite helpful in refreshing my memory. 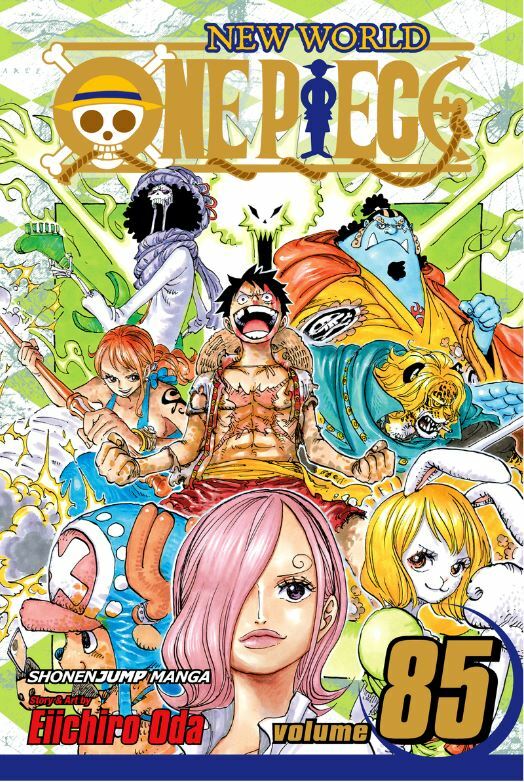 Unlike volume 84’s clunkiness of Sanji’s departure, however, volume 85 is mostly smooth sailing in its pacing and plot progression, beginning with a series of battles involving Chopper/Carrot, Brook, and Pedro before concluding with Luffy and co. joining forces with an unexpected ally, leaving a tantalizing hook for the next book. What are easily the most fascinating developments in this volume is discovering just how deep the web of conspiracies goes amid Luffy and Sanji’s struggles: Big Mom’s family, the Vinsmokes and the Firetanks are all gunning for each other’s heads as Sanji and Pudding’s wedding arrives the next morning, and we tremble as they nearly unravel before the big day; in fact, it very nearly does when Reiju, Sanji’s sister and the only one of his siblings who hadn’t entirely closed off her heart, follows her women’s intuition and begins sniffing after a certain Charlotte family member. While a certain Devil Fruit power ensures her findings don’t leak out, Sanji’s witnessing of the event is nothing less than heartbreaking: his only solace in leaving the crew instantly falls apart upon the one of the most depraved characters yet unmasking herself. Thankfully, there’s enough uplifting moments to counteract the opening gloominess: as we learn from the cover, Jimbei finally returns to rescue Luffy and Nami in the nick of time, and while he hasn’t officially joined the crew yet, his jolly dismissal of his mutiny already shows he’s right at home. Skeleton musician Brook also gets the honor of being the first Straw Hat to square off with one of the Four Emperors, and while the results are what’d you expect (Big Mom trounces him, dresses him up, and obsesses over his one-of-a-kind being), it does lead to a hysterical rescue operation by Chopper and Co., who all try out different tactics to rescue him from the embrace of a sleeping Big Mom. 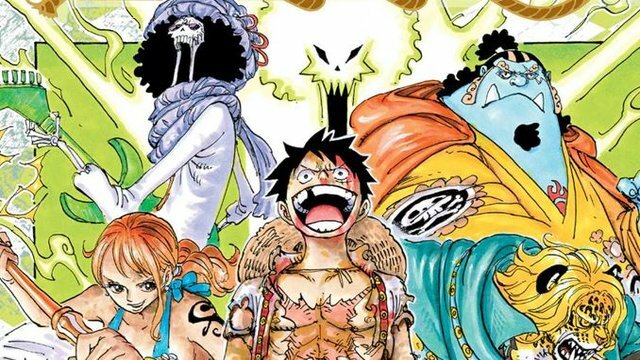 Eiichiro Oda’s art remains a highlight, with Big Mom’s collection of Homies — inanimate objects and animals given human consciousness through her Soul-Soul Fruit abilities — persist as some of his most imaginative yet, although the aesthetic star of this volume is Charlotte Brulee’s Mirro-World. 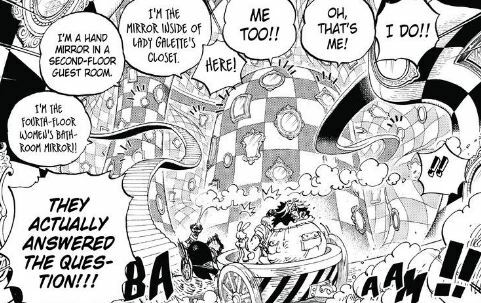 Born from her Mirror-Mirror abilities, it’s an alternate reality full of twists, turns, a Hansel and Gretel-esque Candy House, and mirrors connecting to every mirror within Big Mom’s Totto Land; hilariously, they can all speak and remember who last used their real-world counterparts. It’s more than enough to make up for the relative briskness of the other two powers introduced in this volume (the Memo-Memo Fruit and the Egg-Egg Fruit), and for whatever missteps were made with Sanji in the last volume, you certainly can’t argue with the results here: the gamut of emotions the curly-browed cook makes throughout this volume’s development are painful to witness, right down to his rainy reunion with a starving Luffy. Beginning with this volume, we experience the most fluid pacing Whole Cake Island offers; yes, things can get a little too chaotic, especially with Oda’s post-timeskip trend of jumping back and forth between scenes (chill with the character count, Oda-sensei!). But what does occur still works in pushing the plot forward, and you can’t deny Luffy and co.’s temporary alliance with a certain mafia family isn’t unnerving in its thickly-coated “will he or won’t he screw him over?” apprehension. It’s why I’m all too eager to discuss what I consider the arc’s shining moment in the next volume, but for now, let us appreciate the cogs moving things forward.